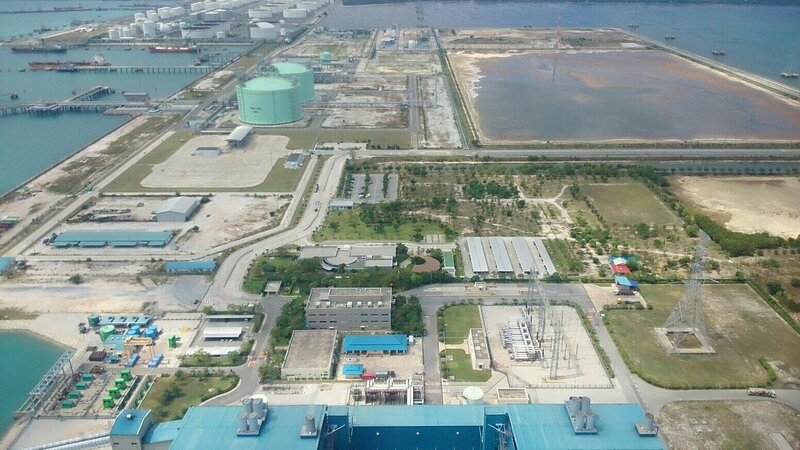 Map Ta Phut industrial area is the largest petrochemical complex in Thailand. Its activities have been related to air and water pollution in the area. A new expansion is under way. Map Ta Phut is a middle-size city located in eastern Thailand, in the province of Rayong, between the touristy areas of Pattaya and Koh Samet. 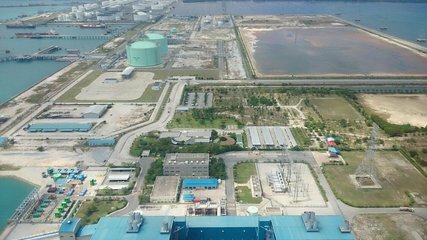 In 1990, the government officially opened the Map Ta Phut Industrial Estate, a large industrial park focused on the petrochemical industry and related sectors. The Industrial Estate was one of the flagship projects of the Eastern Seaboard Development Programme, a massive infrastructure development plan aimed at creating an industrial base for Thailand's modernization. Map Ta Phut industrial area would quickly grow and today it houses five industrial estates, one deep-sea port, and 151 major factories, including petrochemical plants, oil refineries, coal-fired power stations, and iron and steel facilities. Since the early years of the project, villagers in the area have raised concerns about the health and environmental impacts of the factories. In 2007, 11 communities in the Map Ta Phut zone filed a lawsuit against the National Environmental Board (NEB), alleging that the board had improperly failed to designate Map Ta Phut and its vicinity a pollution control zone . In 2009, the Administrative Court ordered the suspension of 76 projects at Map Ta Phut . According to research released one year later, at least 35 of 76 industrial plants suspended in Map Ta Phut industrial estate were using hazardous chemicals that could cause several ailments - from respiratory diseases to cancer - in their production process, environmental and health impact studies have found. Ultimately, 74 of the 76 contested projects were allowed to continue. In 2012, locals also filed a complaint against one of the coal power plants in the area . In 2017, the World Resources Institute denounced that “Map Ta Phut is one of the Thailand’s most toxic hot spots with a well-documented history of air and water pollution, industrial accidents, illegal hazardous waste dumping, and pollution-related health impacts including cancer and birth deformities”, according to a report released by the organization . Several major incidents have also occurred in Map Ta Phut over the last few years. In 2012, a explosion at a factory that produced synthetic materials killed 12 and injured another 129 people . In 2013, the Thai state-owned oil company PTT, that owns facilities in Map Ta Phut, accidentally spilled oil in the area affecting the nearby island of Koh Samet  . In 2014, Sutthi Atchasai, founder and head of the nongovernmental group Eastern People's Network, was found shot dead inside his car. Authorities said that he had committed suicide, a theory that his family rejected. The Thai government has recently approved a new expansion of the industrial area  . The expansion includes the development of the deep sea port and the Smart Park project, a new industrial area that will target industries such as automotive, smart electronics, affluent medical and wellness tourism, agriculture and biotechnology, and food for the future  . The expansion will also include a motorway to connect Map Ta Phut and Bangkok, the capital of the country, and a high speed train line as well as the development of the seaport. Communities in the are opposing the project saying that the expansion will cause further environmental problems  , such as changes in water currents, that will affect the marine resources. Project Details The government has approved 13 billion baths (around USD416 million) for the expansion of Map Ta Phut. Why? Explain briefly. The industrial area has expanded over the last years and companies have been able to continue their activities despite the environmental and health concerns. A new expansion is under way. 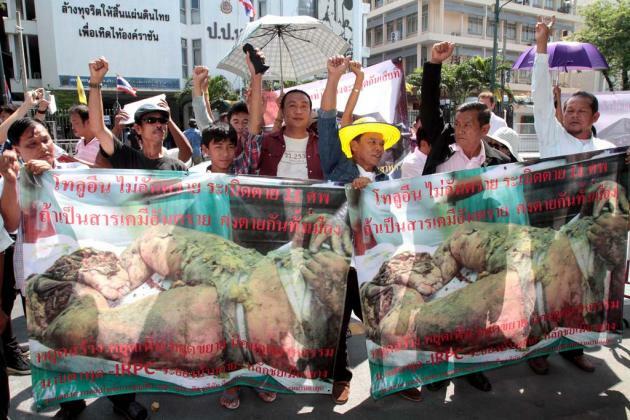 Source: By THE NATION http://www.nationmultimedia.com/national/Map-Ta-Phut-residents-rally-for-govts-assistance-30182099.html A group of protesters rallied outside Government House to demand that the authorities urgently start assisting those affected by the recent factory explosion in Map Ta Phut Industrial Estate in Rayong province. 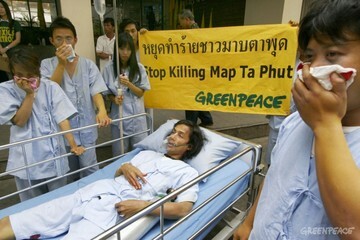 Source: Greenpeace http://www.greenpeace.org/seasia/th/news/industry-minister-must-save-li/ Greenpeace activists dressed as patients and lying on a hospital bed today gathered in front of Thailand's Ministry of Industry to demand that the government immediately declare Map Ta Phut a Pollution Control Zone. The activists carried banners saying "STOP KILLING MAP TA PHUT"